Here’s a very special tote for a very special trip! Your child’s name is embroidered on the front of this personalized girl's overnight bag —inside, there’s plenty of room for jammies, teddy bear, and more. Personalized tote bag features zippered pockets on top and side with two handle styles. Make day trips and sleepovers at Grandma’s house extra special with our embroidered tote bag just right for carrying all the essentials. Specify name; limit 12 letters/spaces. Vinyl. Tote is 17" long x 6" wide x 12 1/2" high. Love this! Wish there was other choices besides castles like flowers or retro designs. bought 2 of these bags for my precious granddaughters. the embroidery work looks expensive. Bags are large enough to hold clothing and even stuffed animals, etc. the bags are great and so was the price! also, i was pleasantly surprised with the super fast delivery. couldn't be more pleased with items and the company. i would buy this product again"
Although we have not actually packed anything into it get, it does appear to be made of quality material. And the personalized name is embroider with a sewing machine, so it won't fade/wipe off. MK very rarely dissapoints me. I needed it personalized, needed it fast, needed it accurate. I got everything I asked for and all with free shipping. Took a ton of stress off my holiday. This item was exactly as described on site, beautifully embroidered with name. My granddaughter took to it right away and we all just love it. My 2 grandchildren love the totes. The tote is quite usable for an overnight stay at Grandmothers and traveling. My 2 grands have two grandmothers to visit and they always carry their totes. Their little sister and cousin will be old enough for one in 2 months, so I am going to get one for them now and give it at Christmas. Perfect to pack clothes for spending the night with grandma. The bag is big enough to pack lots of things not just clothes. Turned out just like I wanted it to. I think it will be perfect for my great-granddaughter. 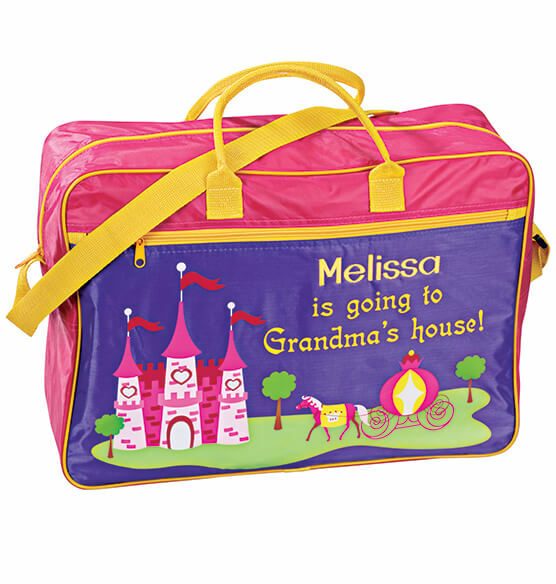 I bought this suitcase for my grand daughter as she loves to come and spend the night with grandma. It has the perfect writing on it. It is big enough for her to put all her clothes, coloring books, crayons, games, etc. for her night with grandma. It is small enough so that she can carry it on her own. Absolutely love this. The bag is better than I expected. Love that the name is embroidered. Very classy. Great for overnight visit to Grandma. Every child needs this travel bag! Nicely made, personalized and colorful. I packed it with new pajamas, bedtime stories, a plushy toy and some other goodies for that Alina will love! I purchased 7 of these bags for the little ones in my life and they were a big hit with the parents. I am excited for my grandkids to use them when they stay overnight. I was worried about the size of them but it is perfect . My only suggestion would be to have some more options for the pictures on the bags. I didn't care for the boys pictures but loved that it was personalized and the price was great. I bought a bags for each of my grandchildren --- they were delighted to get them and can't wait to really get to use them! I buy these for each of my grandchildren. It can be used as a small overnight bag or a bag to bring toys to Grandma's house. I love that it's personalized. This is a nice weekend getaway bag for little girls. The names are not printed but embroidered which makes it even nicer. More than one design choice would be nice. This is the 4th girl's tote I have ordered for my granddaughters, in the same family! The material should be more durable. Would liked to have spelled Grandma differently. I am a first time grandmom. Have not used it yet, but it does state "going to grandma's house. This is the 3rd one I bought for Autumn Jayde...the 1st one ripped after 1 month and the 2nd one shredded on the inside.....hope the 3rd one last forever. I purchased 5 of these totes for my grandchildren, and was so embarrased to see how they tore the first day of use. I bought and bragged about them only to see that they tore to pieces the first week of use. I intended on buying 3 more for my nieces but immediately changed my mind.